This video is about making home made Chicken Cacciatore. Its quick and easy to make,you can serve this over any type of pasta or rice. ENJOY! In a large bowl, combine flour, salt, pepper and chopped parsley. Mix well and add chicken chunks to this mixture. Ensure to coat the chicken chunks with mixture. Heat olive oil in frying pan and transfer the chicken pieces to it. Brown the chicken and once done, transfer to a pot. In same pan, saute onion, pepper and garlic in olive oil. Once tender, add chicken to it and mix well. 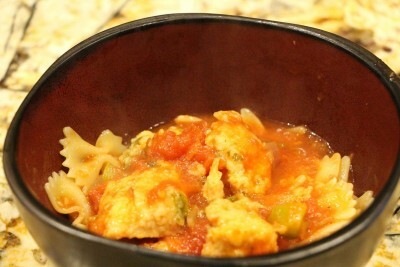 Transfer the chicken mixture to a pot and add tomatoes to it. Add tomato sauce and mix well. Bring to boil and then allow to simmer for 45 minutes in low heat.